Last Tuesday, Tom and I gave a presentation called "African-American Presence in the City of Light" at Adrian Leeds' well-known monthly Parler Paris event. 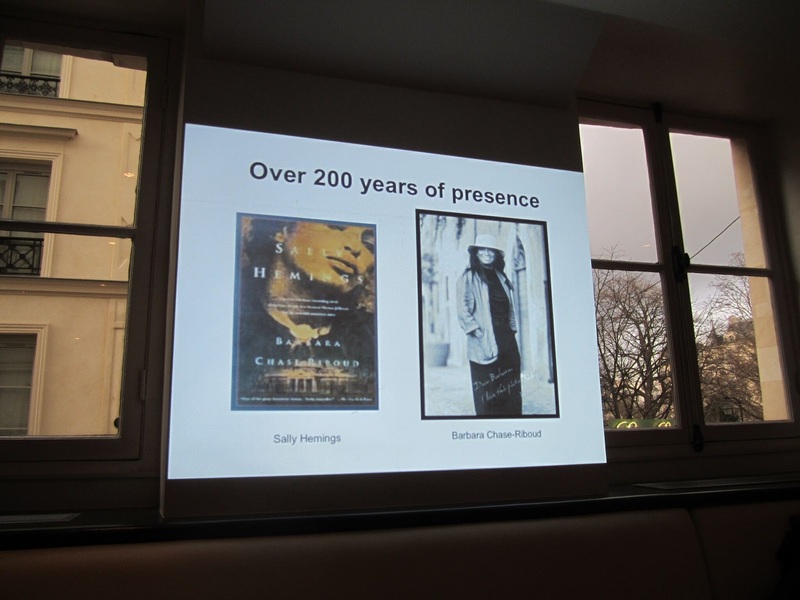 Tom spoke about the Entrée to Black Paris tour that he created - Black History in and around the Luxembourg Garden. 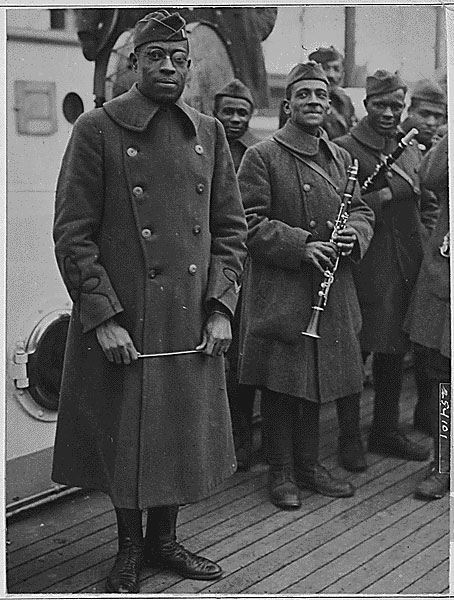 Because he begins the walk with stories about how James Reese Europe and the 369th Infantry Regiment (better known as the Harlem Hellfighters) introduced jazz to France during World War I, he talked about Europe at some length during the Parler Paris presentation. Later during the afternoon, another invited speaker shared some fascinating information about the 369th Infantry Regiment with the audience. 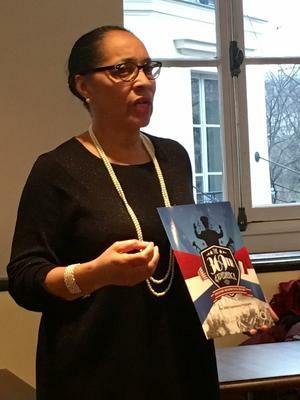 Stephany Neal told us that the infantry's band is going to be recreated as part of a series of events endorsed by the World War I Centennial Commission to commemorate the 100th anniversary of World War I! Students from 107 Historically Black Colleges and Universities (HBCUs) and other colleges and universities across America will be selected to join the band through a competitive search and audition. They will perform in a series of national and international programs and musical events to honor the men who fought during the war. Proposed international performances in France will retrace the 369th campaign with concerts in Brest, Argonne, Chateau Thierry, St. Mihiel, Champagne, Vosges, Metz, and yes, PARIS. The project is an educational initiative that includes master classes conducted by celebrity guest performing artists. Dr. Julian E. White, retired director of the Florida A&M University Marching 100 band, will recreate the 369th's complete repertoire for the project. Another proposed production for the initiative is a traveling exhibition of WWI paintings and military ephemera. Works by African-American artists such as Henry O. Tanner, Palmer Hayden, Nancy Prophet, Loïs Mailou Jones, and Albert Alexander Smith will be displayed. The military ephemera belong to the collection of Alan Laird, an African-American Vietnam War veteran. Items in the collection include historical records, vintage photographs, war art, and vintage print media. The McDowell County Museum Commission (Kimball World War One Memorial) and S&D Consulting Services are organizing The 369th Experience. 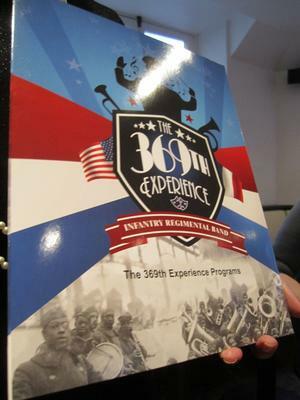 To learn more about it, visit the Web site at www.369Experience.com or call 1-855-GIVE 369 (1-855-448-3369).